Ayurveda is the science of life and well-being. The oldest documented body of holistic medical knowledge, it is a system of plant oils and herbs originating in India over 6,000 years ago. After centuries of testing, Ayurvedic science has proven effective, alleviating concerns about side effects. Kama Ayurveda, a skincare brand from India, established on virtues of a holistic life through ancient Ayurvedic Medicine and Science. 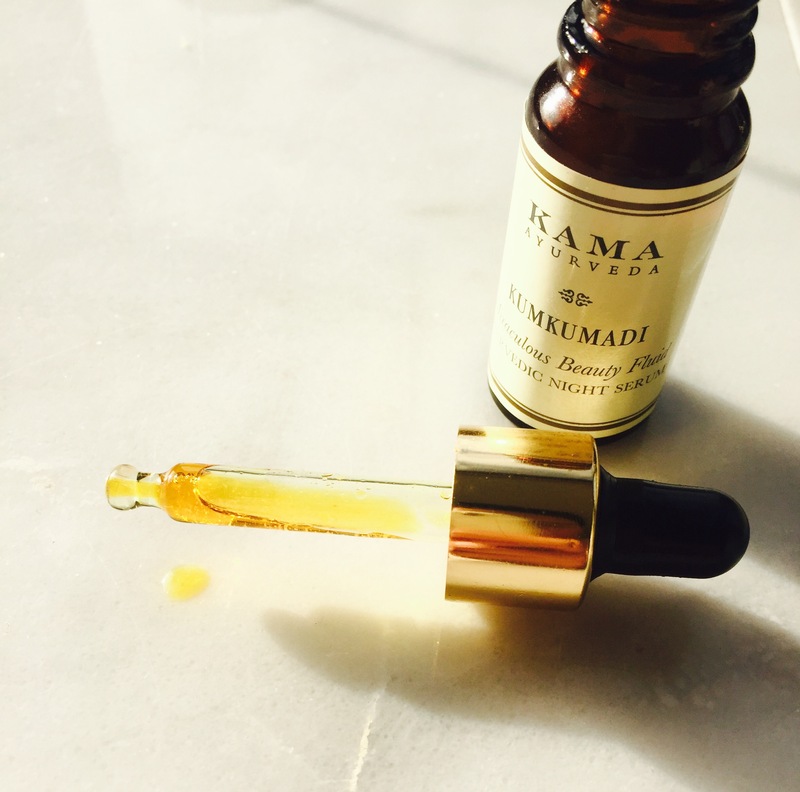 One of the first products I tried from their extensive range was KumKumadi Beauty Fluid. Claims: A unique 100% Ayurvedic anti-ageing serum that hydrates cleans and illuminates the skin. Miraculous Beauty Fluid is a unique blend of oils and herbs formulated to help skin look young and healthy. In Ayurveda, rare pure saffron is known to help illuminate skin color; extracts of Indian madder and the Banyan tree help smooth fine lines; Vetiver, sandalwood and lotus cool and cleanse while helping to clear blemishes; and liqorice acts as an antiseptic, protects the skin from bacterial and fungal infections and improve skin texture. There is certain richness about this oil which can be attributed straight to its unique ingredient list. These ingredients are not seen everyday in a growing market of facial oils. However, if you’ve used Ayurveda oils before this lineup wouldn’t come as a surprise. The lush oil is packaged in a 12ml dark brown glass bottle with a pipette. Admittedly, slightly on the pricier side however in my opinion, it is worth it as a little goes a long way. The aroma may not please everyone, but personally I’m in Love. It has a decent hit of botanical scent, with subtle woody notes wonderfully blended and balanced with the sweetness of saffron. The rich deep yellow shade would be attributed to the saffron as well. The texture is not heavy which allows it to blend seamlessly in the skin and ‘yellowness’ disappears completely. I use about 2-3 drops and push it in my skin and noticed the skin immediately absorbs it (scent lingers for few minutes). The following morning, my skin is noticeably plump, no visible redness, calm and brighter. It also claims to help with fine lines however I’m not a suitable candidate to assess that at this stage, but I still think it’s wonderful as a preventative measure. Layered under my favourite serum Estee Lauder Advanced Night Repair II, the results following morning are nothing short of WOW. On occasions, I wear my Mixologist hat, and mix this oil with Goodness Labs Chia Seed oil or The Body Shop Vitamin E Overnight Serum in Oil (proportion 2:2 drops). It feels like ‘Pampered Skin from a 12ml Bottle’. I have many facial oils, but this one is reserved as my Treat or Royalty Facial oil. Do you know where I can purchase this online or anywhere in Toronto or India? In India they have stores, in Toronto you can buy online on their site or Amazon.